The United States Congress designated the Red Mountain Wilderness (map) in 2006 and it now has a total of 20,520 acres. All of this wilderness is located in Nevada and is managed by the Forest Service. 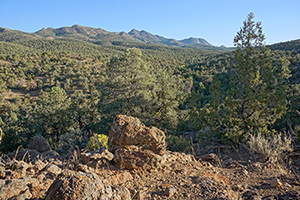 The Red Mountain Wilderness is bordered by the Currant Mountain Wilderness to the west. Adjacent to the Currant Mountain wilderness in the heart of the White Pine Range, Red Mountain stands out against the grey Limestone escarpment with its orange - red volcanic geology. This remote area possesses beautiful scenic vistas and volcanic rock formations.